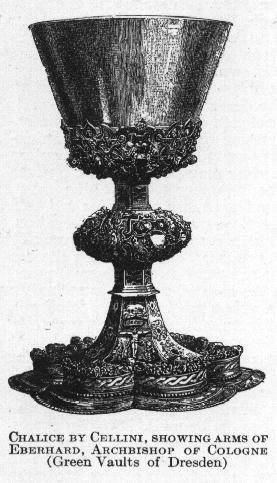 The chalice occupies the first place among sacred vessels, and by a figure of speech the material cup is often used as if it were synonymous with the Precious Blood itself. "The chalice of benediction, which we bless", writes St. Paul, "is it not the communion of the blood of Christ?" (1 Corinthians 10:16). No reliable tradition has been preserved to us regarding the vessel used by Christ at the Last Supper. In the sixth and seventh centuries pilgrims to Jerusalem were led to believe that the actual chalice was still venerated in the church of the Holy Sepulchre, having within it the sponge which was presented to Our Saviour on Calvary. Curiously enough, while Antoninus of Piacenza refers to it as made of onyx, Adamnan, less than a century later, describes it as a "silver cup holding the measure of a Gallic sextarius and with two opposite handles" (see Geyer, Itinera, Hierosolimitana, pp. 154, 173, 234, 305). At a much later period two other vessels have been venerated as the chalice of the Last Supper. One, the sacro catino of Genoa, is rather a dish than a cup and is made of green glass, though long supposed to be an emerald, fourteen and a half inches in diameter and of priceless value. The other, at Valencia in Spain, is a cup of agate. The fact is that the whole tradition is untrustworthy and of late date. It will be referred to further under the article GRAIL, and meanwhile we may be content to quote the words of St. Chrysostom (Hom. l in Matt. ): "The table was not of silver, the chalice was not of gold in which Christ gave His blood to His disciples to drink, and yet everything there was precious and truly fit to inspire awe." So far as it is possible to collect any scraps of information regarding the chalices in use among early Christians, the evidence seems to favour the prevalence of glass, though cups of the precious and of baser metals, of ivory, wood, and even clay were also in use. (See Hefele, Beiträge, II, 323-5.) A passage of St. Irenæus (Hær., I, c. xiii) describing a pretended miracle wrought by Mark the Gnostic who poured white wine into his chalice and then after prayer showed the contents to be red, almost necessarily supposes a vessel of glass, and the glass patens (patenas vitreas) mentioned in the "Liber Pontificalis" under Zephyrinus (202-19) as well as certain passages in Tertullian and St. Jerome, entirely favour the same conclusion. But the tendency to use by preference the precious metals developed early. St. Augustine speaks of two golden and six silver chalices dug up at Cirta in Africa, (Contra Crescon., III, c. xxix), and St. Chrysostom of a golden chalice set with gems (Hom. 1 in Matt.). As regards shape, our principal information at this early period is derived from certain representations, said to be meant for Eucharistic chalices, which are found in early mosaics, sarcophagi, and other monuments of Christian art. The general prevalence of an almost stemless, vase-shaped type with two handles, inclines us to believe that a glass vessel of this nature discovered in the Ostrian catacomb on the Via Nomentana, and now preserved in the Lateran Museum, may really have been a chalice. At an early date it became common to inscribe the donor's name upon costly vessels presented to churches. Thus it is known that Galla Placidia (d. 450) offered a chalice with such an inscription to the church of Zacharias at Ravenna, and the Emperor Valentinian III sent another to the church at Brive. Such goblets were sometimes known as calices literati. 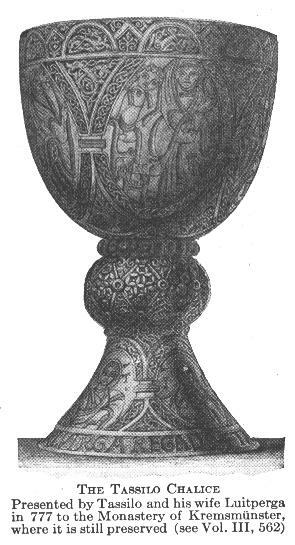 The earliest specimen of a chalice of whose original purpose we can feel reasonably confident is the chalice of Chelles, preserved until the French Revolution and believed to have been wrought by, or at least to date from the time of, the famous artificer St. Eligius of Noyon, who died in 659. The material was gold, richly decorated with enamels and precious stones. In shape it was without handles and like a celery glass, with a very deep cup and no stem, but the cup was joined to the base by a knop, which under the name of nodus or pomellum became a very characteristic feature in the chalices of the Middle Ages. In many of the specimens described or preserved from the Merovingian, Carlovingian, and Romanesque periods, it is possible to make a distinction between the ordinary sacrificial chalice used by bishops and priests in the Mass and the calices ministeriales intended for the Communion of the faithful at Easter and other seasons when many received. 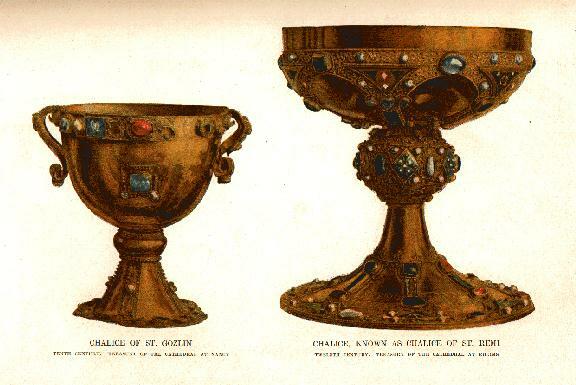 These latter chalices are of considerable size, and they are often, though not always, fitted with handles, which, it is easy to understand, would have afforded additional security against accidents when the sacred vessel was put to the lips of each communicant in turn. In a rude and barbarous age the practical difficulties of Communion under species of wine must have been considerable, and it is not wonderful that from the Carolingian period onwards the device was frequently adopted of using a pipe or reed (known by a variety of names, fistula, tuellus, canna, arundo, pipa, calamus, siphon, etc.) for the Communion of both clergy and people. To this day at the solemn papal high Mass, the chalice is brought from the altar to the pope at his throne, and the pontiff absorbs its contents through a golden pipe. This practice also lasted down to the reformation among the Cistercians. It is certain, however, that the chalices commonly used for the private Masses of parish priests and monks were of a simpler character, and in the eighth, ninth and following centuries much legislation was devoted to securing that chalices should be made of becoming material. From are mark attributed to St. Boniface (c. 740) that in the early ages of the Church the priests were of gold and the chalices of wood, but that now the chalices were of gold and the priests of wood, it might be inferred that he would have favoured simplicity in the furniture of the altar, but the synodal decrees of this period only aimed at promoting suitable reverence for the Mass. England seems to have taken the lead in this matter, and in any case the English canons may be quoted as typical of those which soon afterwards were enforced everywhere. Thus the Council of Celchyth (Chelsea) forbade the use of chalices or patens of horn quod de sanguine sunt, and the canons passed in the reign of Edgar, under St. Dunstan, enjoined that all chalices in which the "housel is hallowed" should be of molten work (calic gegoten) and that none should be hallowed in a wooden vessel. The laws of the Northumbrian priests imposed a fine upon all who should "hallow housel" in a wooden chalice and the so-called canons of Ælfric repeated the injunction that chalices of molten material, gold, silver, glass (glaesen) or tin should be used, not horn, and especially not wood. Horn was rejected because blood had entered into its composition. Probably, however, the most famous decree was that included in the "Corpus Juris" (cap. xlv, dist. i, de consecratione) "that the chalice of the Lord, together with the paten, if not gold, must be entirely made of silver. If, however, anyone is so poor, let him at least have a chalice of pewter. The chalice must not be made of brass or copper, because it generates rust (i.e. verdigris) which causes nausea. And let no one presume to say Mass with a chalice of wood or glass. This decree is traditionally attributed to a certain council of Reims, but Hefele is unable to identify it. From the eleventh century onwards sufficient chalices and representations of chalices survive to enable us to draw conclusions regarding their evolution of form. A round knop, short stem, broad firm base, and wide, rather shallow cup are characteristic of the earlier period. 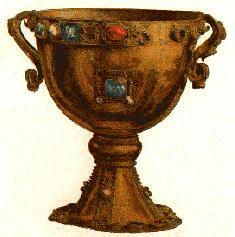 One of the richest surviving examples is the chalice known as that of St. Remi. It is remarkable for the maledictory inscription engraved on its base: QUICUNQUE HUNC CALICEM INVADIAVERIT VEL AB HAC ECCLESIA REMENSI ALIQUO MODO ALIENAVERIT ANATHEMA SIT. FIAT AMEN. In the thirteenth century, while the cup of the ordinary chalice still remains broad and rather low, and base and knop are circular, we find a certain development of the stem. On the other hand the cup, in a large number of examples of the fourteenth century, tends to assume a conical or funnel shape, while the stem and knop become angular, or prismatic in section, generally hexagonal. The base is often divided into six lobes to match the stem, and the knop itself is sometimes resolved into a group of studs or bosses, which in certain fifteenth-century specimens give place to a mass of areading and architectural ornament set with figures. The stem is at the same time elongated and becomes much taller. Under Renaissance influences, on the other hand, the ornamentation in the more sumptuous specimens of chalices is often excessive, spending itself in the form of figured repoussé work upon the base and stem. The cup almost invariably assumes a tulip shape, which continues during the seventeenth and eighteenth centuries, while the chalice greatly increases in height. With this, in the seventeenth century, often went a very thin stem, or again a quite inadequate base, so that many chalices of this period leave the well-founded impression of bring either fragile or top heavy. The question of the restriction of Communion under both kinds and the consequent withdrawal of the chalice from the laity is a matter of some obscurity and does not belong to the present article. In many places where the Precious Blood was no longer given to the people, it seems that to reconcile them more easily to the change, a cup containing simple wine was presented to each communicant as he left the sanctuary after receiving the Sacred Host. Parish priests were enjoined to explain very carefully to the people that this was only ordinary wine intended to enable them to swallow the Host more readily. This practice, called purificatio, is still prescribed as part of the rite of the General Communion on Easter Day in the "Cæremonial Episcoporum" (II, cap. xxix). Probably a special chalice of large capacity was reserved for this purpose. As it was very probably a chalice of large capacity, with handles, it seems impossible to distinguish such a goblet from the calix ministerialis of earlier times. Another kind of chalice referred to by archæologists is that said to have been used after baptism to give milk and honey to the neophytes, but no definite surviving example of such a vessel seems to be known. According to the existing law of the Church the chalice, or at least the cup of it, must be made either of gold or of silver, and in the latter case the bowl must be gilt on the inside. In circumstances of great poverty or in time of persecution a calix stanneus (pewter) may be permitted, but the bowl of this also, like the upper surface of the paten, must be gilt. Before the chalice and paten are used in the Sacrifice of the Mass they require consecration. This rite is carried out according to a form specially provided in the "Pontificale" and involving the use of holy chrism. The consecration must be performed by a bishop (or in the case of chalices intended for monastic use, by an abbot possessing the privilege), and a bishop cannot in an ordinary way delegate any priest to perform this function in his place. Further, if the chalice lose its consecration  which happens for example if it be broken or the cup perforated, or even if it has had to be sent to have the bowl regilded—it is necessary that it should be reconsecrated by the bishop before it can again be used. Strictly speaking, only priests and deacons are permitted to touch the chalice or paten, but leave is usually granted to sacristans and those officially appointed to take charge of the vestments and sacred vessels. These are the corporal, the purificator, the pall, the burse, and the chalice veil. The corporal will be considered separately. The purificator (purificatorium or more anciently emunctorium) now consists of a rectangular piece of linen usually folded twice lengthwise and laid across the top of the chalice. It is used for wiping and drying the chalice, or the paten, or the priest's lips, e.g. after the ablutions. Unlike the corporal and the pall, it requires no special blessing. In the Middles Age it was not customary, as it is nowadays, for each priest to have a purificator of his own, frequently renewed, but it seems that a cloth of this kind was kept at the altar which was used in common by all. The pall is a small square of stiffened linen ornamented with a cross, which is laid upon the orifice of the chalice to protect its contents from flies or dust. The word pallium, or palla, was originally used of all kinds of coverings, notably of what we now call the altar-cloths, and also of the corporal. Even in St. Gregory of Tours (Hist. Franc., VII, xxii) we read of the sacred gifts being veiled by a pallium, which was probably some sort of corporal. But about the time of St. Anselm (c. 1100) the custom seems to have grown up in some places of using two corporals at the altar. One was spread out, and upon it the chalice and host were laid. The other, folded into smaller compass, served only to cover the chalice (sce Giorgi, Liturgia Rom. Pont., II, 220, III, 79-81). This folded corporal is now represented by the little disk of linen which we call the pall. At one time it was forbidden to cover the pall with silk or rich embroidery; now the upper surface may be of silk and embroidered, but the under-side, which is in contact with the chalice, must still be linen. The original identity of the pall and the corporal is further illustrated by the fact that both alike require to be specially blessed before use. The chalice veil and the burse are of comparatively recent introduction. Even Burchard, the compiler of the "Ordo Missae" (1502), now represented by the rubricae generales of the Roman Missal, supposes that the chalice and paten were brought by the priest to the altar in a sacculum or lintheum, which seems to have been the ancestor of the present veil. The burse, which is simply a cover used to keep the corporal from being soiled, and which for that reason was known in Old English as a "corporas-case", is somewhat older. Several medieval burses are still preserved in the collection at Danzig. Nowadays both burse and veil are usually made of the same material as that of the set of vestments to which they belong, and they are similarly ornamented. From what has already been said it will be clear that the chalice, as the most important of all the vessels in church use, must have exercised an incalculable influence upon the early developments of the goldsmith's craft. 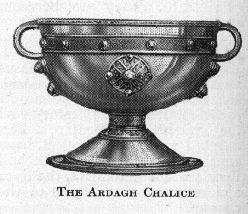 Such monuments as the Ardagh chalice and the Tassilo chalice, both of Irish origin, stand almost alone in the information they afford of an otherwise unsuspected mechanical skill and richness of ornament, particularly in the matter of enamels, in a remote and barbarous age. The earliest, documents connected with the life of St. Patrick reveal the fact that the artificers of chalices and bells had a certain status which in that rude age won respect for the arts of peace. The chalice in a particular way was identified with the priesthood. This sacred vessel, which now stands upon the priest's coffin during his obsequies, recalls the time when a small chalice of metal or of wax was buried with him in his tomb; and the chalice which is the recognized emblem of so many saints  e.g., St. John the Evangelist  suggests in many instances the promise made by Christ to His followers, "if ye shall drink any deadly thing it shall not hurt you". To attempt to illustrate the characteristics of the artistic silver work in the different countries of Europe would take us too far. But it is much to be desired that by the favour shown to good material, skilful workmanship, and a pure type of art, the chalices constructed for the liturgical use of the Church may still serve as an encouragement of all that is best in the craft of the worker in precious metals. ECCLESIASTICAL LAW.-BARBIER DE MONTAULT, Le mobilier ecclésiastique (2 vols., Paris, 1887) ; VAN DER STAPPEN, Sacra Liturgia (Mechlin, 1903), III, 96-110; WERNZ, Jus Decretalium (Rome, 1903), III. MLA citation. Thurston, Herbert. "Chalice." The Catholic Encyclopedia. Vol. 3. New York: Robert Appleton Company, 1908. <http://www.newadvent.org/cathen/03561a.htm>.